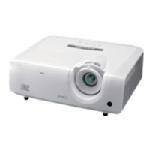 This bundle includes (1) XD250U-ST DLP projector and (1) eBeam Edge. In the past, attempting to show large projected presentations in small rooms could prove quite difficult, as a projector would need to take up a lot of desk space in order to show a sufficiently large image. Thanks to the short throw projector from Mitsubishi Electric however, this problem is a thing of the past. Requiring only an 83cm distance to deliver a 1.5m projection image, the XD250U-ST can be placed right at the edge of a table top, eliminating the loss of workspace commonly associated with conventional projectors. The XD250U-ST's lightweight and compact design also makes it ideal for sales presentations on the move or easy transfer between classrooms. Great images in limited area aren't the only thing going for the XD250U-ST, as it also features an outstanding range of value-added functions. The built-in 10W speaker effectively eliminates the need for an external audio system in small rooms, while the "Audio Mix" feature allows the user to connect two audio inputs to the projector (e.g. a microphone and DVD player) and control each of the input volumes separately. The projector can be connected to a local area network for remote monitoring and control, and the visual PA feature allows messages to be simultaneously broadcast to multiple Mitsubishi projectors on the network. Low operating costs are also a standout feature of the XD250U-ST, with a staggering lamp life of up to 6000 hours ensuring far fewer lamp changes, and a filter free design meaning less downtime for maintenance.